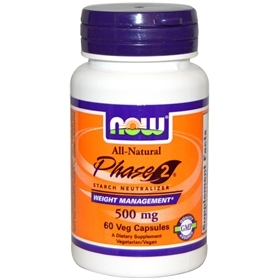 NOW PHASE 2 helps you achieve dietary managment objectives without the use of stimulants or laxatives. PHASE 2 is an all-natural bean extract that has been shown in non-clinical studies to help reduce the breakdown and abosrption of complex carbohydrates, by limiting the action of alpha-amylase, a digestive enzyme. Alpha-amylase helps break down dietary starches into glucose so that they can be absorbed by the digestive tracts. With less alpha-amylase activity, there may be less excess glucose available to convert into fat and store as adipose tissue. Now you don't have to feel bad about consuming carbohydrates. NOW Starch Neutralizer works by neutralizing the enzymes in the digestive system responsible for converting carbs to fat. Clinical studies show that Phase 2 white kidney bean extract really works. One eight week study found that individuals who took Phase 2 carb blocker lost 129% more weight than the rest of the participants. Each capsule blocks more than 1,000 calories of starch. Multiple clinical studies that have proven its safe for consumption and effective at blocking carbs. Suggested Use: As a dietary supplement, take 3 Vcaps® before any meal containing complex carbohydrates or starches, or as directed by a health care practitioner. Free of: sugar, salt, yeast, wheat, gluten, corn, soy, milk or preservatives. Other Ingredients: Cellulose (capsule), Cellulose and Gum Acacia. Vegetarian Formula.